Miss Moneypenny never had a first name (not until 2012). She was the office babe who diligently sacrificed her life for the greater needs of the agency. She was your mum's secretary; the nameless Miss of the 1960s, expected to settle for mediocrity. But stereotypes die hard and Miss Moneypenny no longer exemplifies the life of today's PAs, EAs, and Office Managers. Salaries are up, niche skills are rewarded, and technology has made the executive gatekeeper all the more indispensable. Secretarial roles have disappeared in two senses; literally and figuratively. According to a study from the University of Oxford, 33,000 secretarial roles disappeared between 2001 and 2013 in London alone (44% decline) and 163,000 in the UK as a whole (47% decline). The numbers point to a role in decline, but in reality, the role has matured and undergone a makeover. You’ll be hard pressed to find companies recruiting “secretaries”, and if they are, expect to be paid significantly less than your Executive Administrator counterparts. 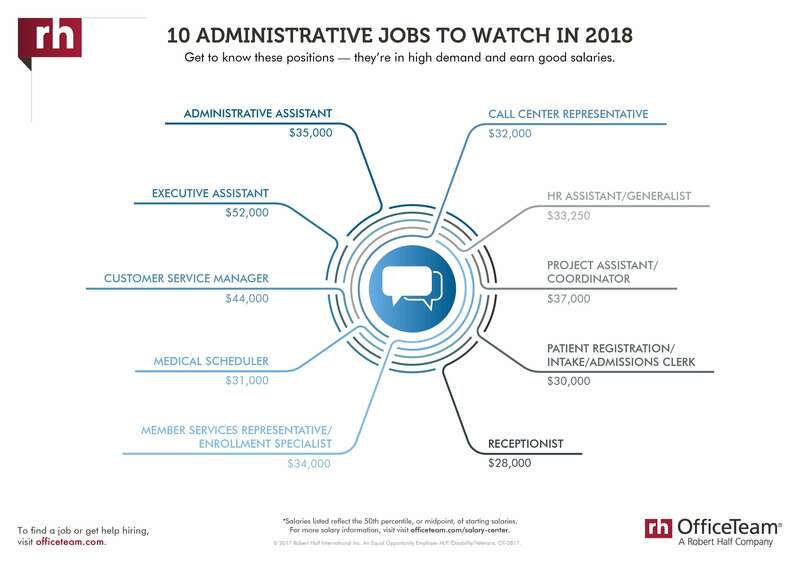 According to Robert Half, a global recruitment firm, “Administrative Assistants” can expect to earn 33% less than “Executive Assistants” and 23% more than “Receptionists”. The title “Secretary” not only carries too much baggage from its past days of the pretty lady who serves coffee, but the reality of the role has largely outgrown its old desk and its old paycheck. If your job title doesn’t properly match your job duties, have this conversation with your boss and get your title changed. An increased salary (if not immediately) will follow, and you will be supported by 93% of admin professionals who say their “job title is at least somewhat important” (data via International Association of Administrative Professionals). The 2008 financial crisis brought about a significant shift for admin professionals. As middle management was laid off, and not replaced, their workload was passed to executive admins. They weren’t called managers, but they had projects to lead and important decisions to make. Admins went from passive, reactive roles to assertive, proactive roles bringing the job into a business manager relm. PAs and EAs may now be responsible for training staff in the latest software programmes, carry 6-figure budgets, support or lead major procurement decisions, handle payroll duties and directly impact hiring and termination decisions. Their efforts alone often direct company culture in a unique way because their job touches so many critical aspects of the business. As technology seeped into the every movement of office life, dire predictions were made about the collapse of the admin. As noted before, traditional “secretary” jobs did disappear, but not at the hand of technology. The digital accessibility of senior executives combined with the relative speed of communication means Executive Assistants are more indispensable than ever. Technology freed PAs and EAs from routine clerical work and a career centered on dictation, and has pushed them to a central point of being airtraffic controler for all these digital platforms. Where proficiency in Microsoft Office used to be the high bar it’s now the minimum expected technical fluency required. Many admin professionals are expected to work effectively with cloud-based apps, database management, social media, and sometimes even website maintenance. What's been your career growth experience as a Personal Assistant, Executive Assistant or Office Manager? We'd like to hear from you! Follow us on Twitter, Facebook LinkedIn or Instagram to share your PA story.